Can pi be fun? Of course it can! Remember pi is the ratio of the circumference of a circle to its diameter. It is an irrational number which means it cannot be written as a fraction but it can be written as a non-repeating decimal. But for ease of calculation we’ve all used it in math class as 3.14 (and today is March 14, get it?). There is an invented language/dialect called “Pilish” in which the numbers of letters in successive words match the digits of pi. There is actually a book written entirely in Pilish by Mike Keith called Not a Wake. The record for most pi digits memorized belongs to Lu Chao of China. Set in 2005, he managed to recite 67,890 digits. Pi has been calculated to 22,459,157,718,361 digits. If you hold a mirror up to 3.14, it spells PIE! And that last one is more reason to have pie on pi day! Bookman and I celebrated with a shepherd’s pie. He used a casserole dish so it isn’t exactly round, but the intent is there! The potatoes on top got a little extra brown but it all tasted delicious. Inside was lentils, garlic, onion, peas, corn, mushrooms and spinach. Lots of leftovers so we get to have it again. And again. And probably again. Did you know that January 23rd and December 1st are National Pie Day? But wait! There is also a National Blueberry Pie Day (April 28), a National Strawberry-Rhubarb Pie Day (June 9), National Strawberry Pie Day (September 28), and National Boston Cream Pie Day (October 23) — overlooking the fact that Boston Cream Pie is actually a cake but it is still round so it counts. Kind of. I am for sure celebrating National Blueberry Pie day….Blueberry +Cream+Sugar = Unmitigated Happiness…lol! 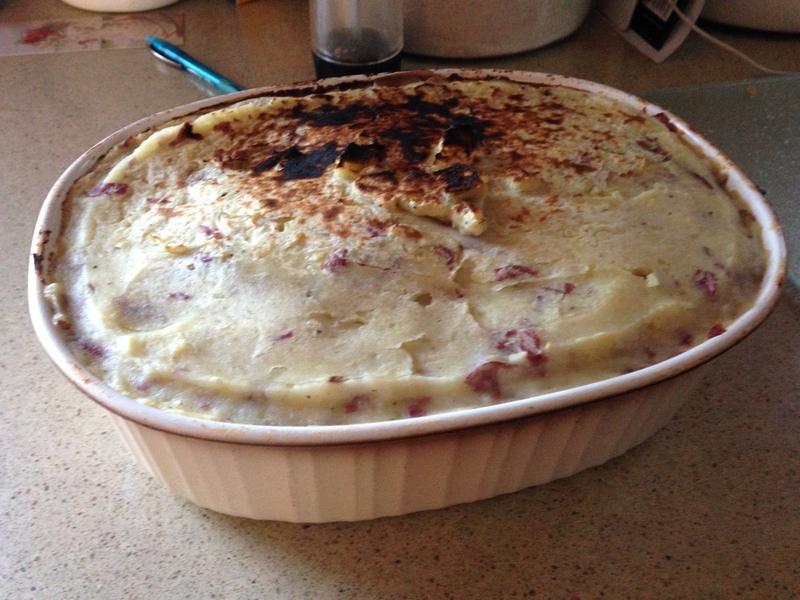 I am sure The Shepard’s Pie was delicious! Brian Joseph, good plan! One should definitely celebrate pie at every opportunity! Oh my, the mirror trick freaked me out. That’s a weird coincidence! Dorothea, the mirror thing is pretty freaky! I was drooling over the shepherd’s pie and then you went on to mention all those other pies. Pies are seriously under rated. I love pies! If I can only figure out how to work the not new but new to me and overly complicated touch screen oven in our new house, I can get back to baking pies! Happy Pi Day a day late! Joan, I hope you figure out the oven soon and start baking pies! Yuuuum! Happy Pi and Pie day! Happy Pie Day! Though I can safely say that if there’s one book I shall never read, it’s Not A Wake. Oops meant to write Pi(e). I gather from your facts about pies that people just… well, they just like pies don’t they! To be honest, the pi-facts were pretty mind boggling. Like the calculator one, and the fact that the Babylonians figured it out over 4000 years ago… how did they do it? See I was going to behave myself and have a boring salad for supper but now that you have trilled on pi I think I must have a pie! Ocean Bream, I hope you had pie for supper and I hope it was delicious! I was surprised about the Babylonians, pretty cool. Never too much pie for me, ha ha! I can’t imagine memorizing something to that degree (the person in China.) What a feat! Laila, I wonder how long it took the guy to memorize all those digits? And I agree, one can never have too much pie! Lots of fun facts about pi(e)! And your pie sounds delish! Iliana, I didn’t expect to find so many fun facts when I went searching for them. We had several days of pie leftovers so it was a good thing it was so tasty! Happy Pi 3.14159 day to you. I always think of the mathematical formula when I hear of this day for some reason. Anyway, I wanted to tell you how happy I am to find another librarian on the web. I discovered your site somehow from the black hole of the inter-webs, and I’m glad I did. I’m new to blogging, but I appreciate the wealth of information I’ve already read from your site. Have a lovely week-end from one book lover to another! Yay for pi! And yay for the Babylonians for doing such a great job way back in the day! Life’s been so busy lately that I had totally forgotten about Pi Day on March 14th until it was nearly over!